Sophisticated laboratory technology used in saddle and riding research is being adapted to provide simple, inexpensive equipment that can be used by riders, trainers and veterinarians. Professor Emerita Hilary Clayton, from Sport Horse Science in Michigan, told delegates at the second Saddle Research Trust Conference in Britain of technical innovations now available to those in the horse industry. She used as examples the Coach’s Eye, the Smart Ride Balance Sensor, and the Level Belt Pro app from Perfect Practice Pro. Coach’s Eye is a simple, inexpensive app for a smart phone or tablet used to record, manipulate and analyse videos. Among its features, key moments can be viewed repeatedly with precise video scrubbing and slow-motion playback. This type of software, she said, had many veterinary applications for evaluating movements of horse and rider. The Smart Ride Balance Sensor is a portable electronic training system worn by riders to provide real-time feedback about their balance and symmetry in the saddle. It comprises a pad with dozens of sensors and enclosed in a neoprene pouch that fits into a special pair of breeches. The sensor pad continually measures force exerted on the saddle by the rider. 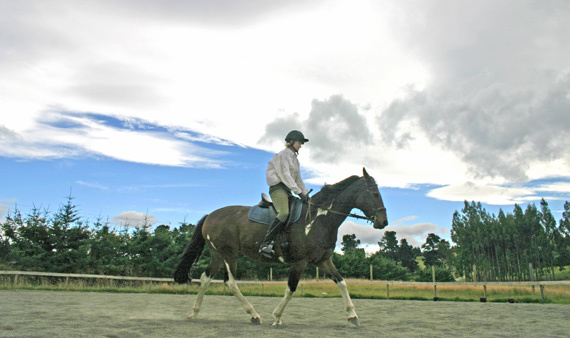 This information is conveyed to the rider through a pair of vibrating buzzers placed inside the rider’s waistband, which signals to them of the state of their weight distribution. The Level Belt Pro app works on a smart phone or iPod to help athletes improve their core strength and control by providing instant feedback about movements of the pelvis and/or the trunk. It uses an inertial sensor inside the phone. The app uses this sensor to detect when the person wearing it leans forwards/backwards or sideways. The company offers a neoprene Level Belt with an attached holder for the phone to secure it around the rider’s pelvis or chest. The conference has been reviewed in Equine Veterinary Education, the official education journal of the British Equine Veterinary Association. “Horses, Saddles and Riders – Applying the Science”, by Professor Hilary Clayton, Dr Sue Dyson, Professor Pat Harris and Anne Bondi, provides a six-page review of the papers presented at the conference and research workshop held last November. The public conference attracted about 400 delegates from many quarters of the equestrian industry, to hear the world’s leading veterinary and scientific experts in this area discuss and debate the latest research on saddle-related equine welfare and performance issues. The conference, only the second of its kind ever held, saw vets, saddlers and equine therapists joining professional riders and trainers as well as leisure owners and riders to hear international experts share their experience. Clayton, H.M., Dyson, S., Harris, P. and Bondi, A.